The political arena was up in arms Thursday, following Ynet's report of a meeting between MK Hanin Zoabi (Balad) and several Hamas officials. Zoabi met with several senior Hamas members, including Parliament President Aziz Dwaik and Mariam Saleh, the former minister of women's affairs in Hamas government in Gaza, in December. Later Thursday, Palestinian sources reported that Dwaik was arrested at the Jaba checkpoint near Ramallah, while on his way to Hebron. The Palestinian Parliament released a statement appealing to Egypt to intervene on behalf of his immediate release. The National Union party released a statement on Thursday, condemning Zoabi and urging the Knesset the revoke her parliamentary immunity: "Zoabi and Tibi both prove that they do not belong in the Knesset but in jail – where all traitors to the State of Israel belong." "We expect the Attorney General's Office to file charges of treason and aiding a terror group against her," the statement said. "He cannot cite 'lack of evidence' as an excuse this time." MK Uri Ariel (National Union) added that Zoabi's meeting with Hamas officials was a "first-class scandal" adding: "She is a traitor and should be tried as such. The Knesset speaker must order her immunity revoked without delay." MK Alex Miller (Yisrael Beiteinu) said that the Balad Party should be disqualified from the Knesset, "since every one of its members has been questioned, at some point, for aiding a terror organization. "It's time to disqualify Balad and end this charade. Elected public officials cannot be allowed to legitimize terrorists how target Israeli citizens," he said. The Legal Forum for the Land of Israel petitioned Attorney General Yehuda Weinstein to order the police to officially investigate Zoabi for aiding a terror organization. 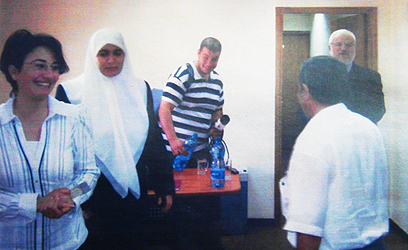 The pictures of Zoabi with Hamas officials "prove that her loyalty to Israel and its laws is questionable. MK Zoabi's meetings with Hamas officials are not irregular and are in direct continuity with the events of the Gaza flotilla, in which she participated alongside other lawless individuals who endangered the lives of IDF soldiers," the petition said. MK Yoel Hasson, chairman of the Kadima faction, added: "Zoabi has long since forgotten who her public is – she has abandoned them from preliminary action on behalf of various terror groups." In light of her involvement in the Marama and the photos depicting her with Hamas officials, he added, "I find it deeply disconcerting that she is still serving as an Knesset member in Israel." Zoabi herself confirmed the meeting, saying she saw nothing wrong with her actions: "The entire world recognizes Hamas now and I think it's time Israel did so as well. We don't consider Hamas to be a terror organization," she said. See all talkbacks "MKs: Zoabi should be tried for treason"